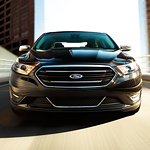 If you are in the market for a full size sedan, the Ford Taurus is an exceptional model. Our team at Ray Price Ford share a goal to help our consumers understand the features that come with the models that they are interested in, and the Ford Taurus comes with technology features that are advanced and offer convenience. The Taurus comes with the SYNC 3 infotainment system that supports Apple CarPlay and Android Auto. With this system, you can take advantage of a six-month subscription to SiriusXM and a five-year subscription to Travel Link and Traffic. The SYNC 3 makes it easy for you to get to any destination because it offers turn-by-turn directions, and the touchscreen is user-friendly. Ford+Alexa also comes with the Taurus, which allows you to control your Smart Home devices from within the vehicle. This feature also comes with more than 45,000 skills, Amazon Prime, voice navigation, and traffic updates.